NextThe rise and rise of The Regrettes: Interview with frontwoman Lydia Night. It’s fair to say the Australian music scene was about to go through another cyclical change during the early to mid 1980’s. Part of that was a popular funk pop group called I’m Talking. While notable artists worldwide dominated the charts across different genres, I’m Talking spearheaded by Robert Goodge, and alongside him, an extraordinary group of individuals, which included Kate Ceberano and Zan Abeyratne, were about to inspire a new generation of kids out of Melbourne’s club scene. By the mid ‘80’s I’m Talking had several certified hits under their belt in Trust Me, Lead The Way and the Rose Royce song Love Don’t Live Here Anymore. But by 1987, the band decided to call it quits with many members pulling in different creative directions. Notably, Kate Ceberano went on to have an illustrious solo career. However, although I’m Talking’s fame was brief, their music and legacy is still felt today. Their only official album would become recognized as one of ‘The 100 Best Australian Albums’ of all time. It is timely that I should talk to founding member Robert Goodge on the eve of the re-release of their album Bear Witness. I also understand Don Bartley totally remastered it using mainly analogue processes for a new generation to discover and enjoy the spirit of I’m Talking. For those of us that remember the mid ‘80’s, many of us were mesmerised by the glamour and pop of artists like Bowie, Prince and Madonna, but then I’m Talking came along with its debut single Trust Me, something uniquely original that grabbed our attention. With its slick dance and pop undertones, it was something I had not really heard from an Australian group at the time. Is that a fair comment? And why? There were Australian groups in this similar area [like Pel Mel for instance ] but we were in the minority thats for sure…We came out of the inner city music scene and had been listening to music being played on stations like 3RRR and 3PBS which had just started and who played a myriad of styles. We were a bit different but then the times they were a changing….We were sick of blokey pub rock bands…Dance music at the time was seductive and powerful we wanted to be part of it. I’m Talking in a sense brought dance to the foreground in Australia in the early to mid 80’s. The reputation of your album, Bear Witness, in particular, which generated a number of hits like Holy Word and Do You Wanna Be proved we didn’t have to look abroad for inspiration. What do you remember about those days? Was there a curious reaction from overseas about what I’m Talking was doing? But of course our inspirations came from O/S though! But we didn’t slavishly copy any particular band or trend, and were happy to mix things up in our own way…We got a lot of attention from O/ S…memorable things like George Michael recommending us to his manager and Scritti Pollitti getting in touch. From the very opening notes of Do You Wanna Be, the album could have so easily been a straightforward synth pop album. But there is enough diversity across the album that I believe really worked well. Looking back was that always the intention or was it something that just grew out of the collaborative process? If you had to choose one song that captures the spirit of I’m Talking, which would it be and why? Probably our first indy single Someday in its 12” extended mix because it encapsulates all our musical desires to mix dance and pop and to cut loose in the exciting world of extended mixes even when you weren’t sure how to do it. Bear Witness as an album that is wildly ambitious. It’s no wonder it was recognised in ‘The 100 Best Australian Albums’ of all time in 2010. How does that honour sit with you now some 32 years after its release? We are so pleased that people still want to listen to the music we made all those years ago…i think thats a testament to listening to your own dreams and desires when making music and doing what you feel a passion for. 6. Nostalgia is a wonderful thing. 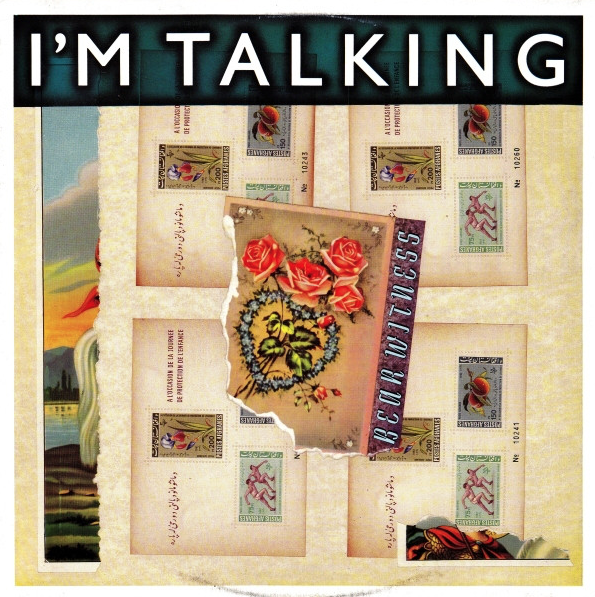 What do you think most people fondly remember about I’m Talking? I think they remember that we were a bit different…a mix of male/female, a mix of backgrounds… but i think they just like the songs and the powerful singing. You’d be pressed to find a widely eclectic group of musicians out there nowadays. How did I’m Talking with originally six, then seven members, manage to make it all work? Your cover of Love Don’t Live Here Anymore stands as one of my favourite songs of all time. I still believe it’s even better than Madonna’ version of it. Tackling a well-known ballad like that was brave and despite it being a cover you still managed to make it your own! Can you tell me the story behind it and why I’m Talking chose to cover Rose Royce’s great song? Stephen Charlesworth our keyboard player chose it because it was one of his favourite songs. We did it from our earliest performances and just arranged it to suit the instruments in the band. Kate always sang it fantastically and it became an audience favourite..We originally recorded it as a B side but radio started playing it and it became very popular so we put it out as an A side in it’s own right. Do you have any regrets about the band never going back and recording a second album? Not really , what is done is done, thats how it went down…but we will be remixing some tracks soon! Finally, the remastered reissue of ‘Bear Witness’ will be released digitally and on formats including, a 10 track 12” (180gm) vinyl album and a deluxe 2CD package which will feature extra songs and live recordings. What was the process like assembling it all? What is your hope for the album’s reissue? It was a LOT of work, finding things and re-connecting with band members, but it was very satisfying to have the ability to once again control the music…very much like we were an indy band again just starting over..A lot of fun…Our hope is that people find the music again[or for the first time] and enjoy listening to it. The long awaited re-release of Bear Witness is available in all good record stores and digitally. For more information on I’m Talking you can visit Mushroom Promotions. You can connect with I’m Talking via their Facebook page. Follow them on Instagram. Watch them on You Tube. Photo credit: The header image of I’m Talking is courtesy of Mushroom Promotions. I am not the uploader of You Tube clips embedded here. Robert, do you know the story of the ‘60s girls group from Australia? Vietnam era. Outstanding movie of them “The Sapphires” was one of the best. Jennie, yes there have been lots of great groups and musicians out there with really interesting stories that perhaps get overlooked…this transition period in Australia when the 70’s rolled into the 80’s was a particularly interesting time to be around.